What are the top landmarks in Croydon? Merton is a welcoming neighbourhood that’s popular for its bars. The neighbourhood has many charming qualities, with its small-town feel among the more noteworthy. Broaden your horizons with some local theatre scene. London Borough of Bromley is a welcoming neighbourhood that’s popular for its bars. Many visitors come to enjoy the natural beauty of the gardens. South Norwood is a welcoming, walkable neighbourhood with convenient options for bars, restaurants and coffee shops. Part of the neighbourhood’s charm is its festivals. Broaden your horizons with some local shopping. I lived in the hotel for a few days and was more than happy with the place. Staff were all friendly and helpful and made the stay pleasant. What I did not like is their shower. It has no control. Too hot and too cold. We were unable to set it to make it warm. All through our stay we couldn't get a stable setting for bathing, it's always too hot or cold. If you book a Croydon hotel, then you’ll find yourself just 20 minutes from Gatwick Airport, and 15 minutes from central London via regular train services. What’s more, as Croydon is largely residential, you’ll benefit from better deals and wider availability on hotels in the area. Croydon is the largest of London's boroughs by population, representing the southernmost point of the UK capital. At its heart lies the town of Croydon, a major financial and cultural hub that has experienced rapid growth in recent years. The town of Croydon currently aims to become London’s 3rd city by 2020, taking its place alongside the City of Westminster and the City of London. 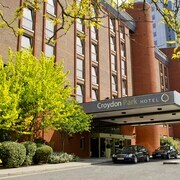 Today Croydon is well placed for travellers arriving or flying from Gatwick Airport. Frequent trains mean that sightseers can reach Buckingham Palace, to the north, in less than half an hour and the seaside resort of Brighton, to the south, in just over half an hour. As well as plenty of unmissable shopping areas, such as the Whitgift and Centrale, there are also a number of fine restaurants, bars and cafes, meaning that you can always find what you need close to your hotel without having to travel further into the Big Smoke. Croydon is also graced with several green spaces to relax in and a thriving arts scene to explore. There are more than 120 parks in Croydon, ranging from formal gardens to woodlands, as well as the hills and rivers that make up much of the borough’s landscape. Despite having so much open countryside on its doorstep, Croydon is also a proud centre of commerce and business. It is known as the Dallas of the South, due to certain areas being dominated by shiny glass and steel high-rise office blocks. The government’s Home Office is based here, as are the UK headquarters of many multinational concerns. The artistic hub of Croydon is undoubtedly the Clock Tower. This contains a vibrant arts centre, hosting regular exhibitions, the Museum of Croydon and the David Lean Cinema, whose screenings programme includes cult, art and international movies. Among those who have drawn inspiration from living in Croydon are Sherlock Holmes’ creator Sir Arthur Conan Doyle, supermodel Kate Moss, French author Émile Zola, dubstep pioneer Benga and Captain Sensible of the punk band, The Damned. For those who view Croydon hotels as an ideal home base for London sightseeing, the east of the borough is the place to be. Regular northbound trains serve the city centre, while southbound routes lead to Brighton; a tram service also links Croydon to the Tube network, taking all the hassle out of getting around. Hotels in Norwood are conveniently located near a rail station, with a handy service running to a href="https://www.expedia.co.uk/London-Bridge-Hotels.0-l508412-0.Travel-Guide-Filter-Hotels">London Bridge, so history buffs may want to consider some of the properties found here. Purley is home to some of the highest earners in the UK, particularly on the Webb Estate. 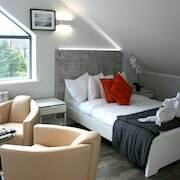 Here, the lavish, million-pound residences of celebrities and entrepreneurs are interspersed with an assortment of hotels with very fine facilities indeed. 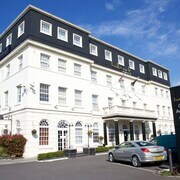 If you're looking for a luxurious hotel in Purley, try the 4-star De Vere Selsdon Estate. For a slice of rural scenery, the Coulsdon district is tough to beat, with many hotels offering balcony views over the fields of Surrey. Hotels in Croydon tend to be more cost-effective than hotels in more central areas of London, so you’ll find a comprehensive selection of 3- and 4-star properties in the area. If you’re looking for a little luxury, you can opt for brand-name offerings with pools, full-service spas and on-site holistic specialists. Cost-conscious travellers are also looked after, with diverse offerings of 2- and 3-star establishments, as well as homey guesthouses and welcoming bed and breakfasts. A quick look at the Grand Sapphire Hotel’s amenities prove that low-cost doesn’t have to mean no-frills, a common staple of Croydon’s budget-friendly listings. 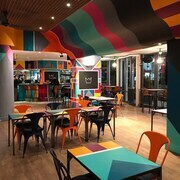 Family-friendly hotels in Croydon often provide a play zone inside or outside the building, and have a choice of larger and adjoining rooms for families. Corporate travellers can find business-oriented hotels that provide workspaces, meeting rooms and high-speed Wi-Fi, so getting work done out of the office is a cinch. Further afield, Croydon takes advantage of Surrey’s stunning countryside for scenic golf courses that are a hit with avid players and amateur fans alike. Croydon’s vibrant culture and friendly ambience make it a refreshing base for those flying into or out of Gatwick; with the airport clocking in at just 20 minutes away by train, it’s the ideal spot for early-morning departures or midnight arrivals to the bustling city of London. Convenient train connections link Croydon to northern England so if you fancy a night away from the capital, check out Expedia's hotels in Liverpool or hotels in Manchester and in under 4 hours, you'll be ready to explore. You can save even more on your flight and Croydon hotel when you book the two together with Expedia. Explore Croydon with Expedia's Travel Guides to find the best flights, cars, holiday packages and more!